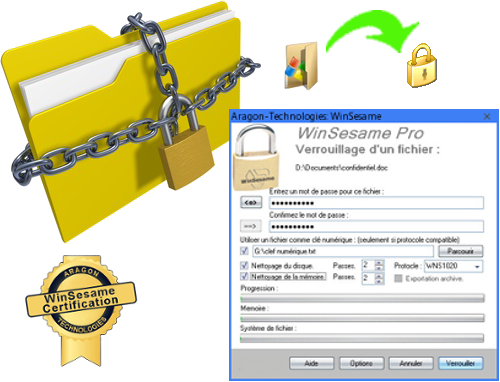 There is a free version of WinSesame which you can use freely. This version limits the size of the folders you can lock but not the length of time it can be used. It means that if you need to lock only small folders you can use it indefinitely. The size of the folders that can be locked with the free version is 1Mb. Which allows you to lock folders containing few word or exel documents but not photos, videos or company accounting. Standard uses of the free version: a password manager where you can store all your passwords or a highly confidential folder to store the credit card numbers you use for your purchases on the Internet. From the free version you can upgrade to a full version in two clicks. IMPORTANT: The free version is limited only for the locking of the folders but not for their opening so that it is always possible to open a big WinSesame folder with the free version. It is a safety feature against loss of data in the event of unavailability of a registered version. You will always be able to recover your data with a free version of the software (which it is advised to save somewhere).